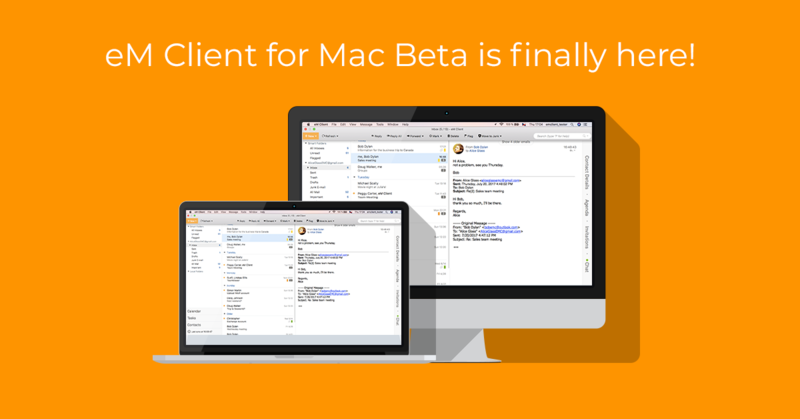 We are happy to announce the beta release of eM Client for Mac. It was a challenging and complex task, but we are excited to finally share it with you. eM Client for Mac includes all the functionality of the Windows version, making it one of the most interesting email applications on Mac OS. eM Client for Mac is not just a clone of the Windows version but is tied to Mac OS in the way you’d expect. This applies, for example, to the use of standard operating system notifications and other system integration. We want to emphasize that this is still a Beta version. Although it has undergone thorough internal testing and a significant amount of our beta testers have been using it for some time, it can still contain bugs and we cannot guarantee its 100% reliability. There is still a lot of work ahead of us, but we believe that we can solve any problems quickly and will soon release the final version. But we do need your help. We appreciate all feedback not only concerning the technical issues but also your feelings about the appearance of the application in a different operating system from Windows. We are aware of some imperfections in the user interface across the application. These are, for example, misplaced controls, bad alignments, bad font sizes, and so on. These problems are being resolved one by one and should not appear in the final version. However, it will help us greatly if you report these errors (preferably by sending screenshots to the email address at the end of this article). For potential performance issues, we've added a simple profiling feature in the beta, which will allow us to identify and then debug these situations (if encountered). So, if your application responds slowly, or takes over too many system resources, use the Profile for 5 seconds feature in the Help menu. Log results can be found in the Help > Open Log Directory section. S/MIME is not working in this version yet. It is a rather complex issue we need to resolve here, but we are working on that. PGP encryption should be fully functional. Spell-check on Mac version works differently from Windows. It uses the operating system settings as well as dictionaries that are downloaded in the system. This feature has been added recently to Mac version so you may encounter some problems here. As with the other issues, just let us know about them so we can solve them. Unfortunately, a Fruux calendar account cannot be set up in this version yet. SSO on Exchange servers is another thing that doesn't work on Beta yet. We look forward to your feedback, comments, ideas and bug reports. Send them to testing@emclient.com. Thanks in advance for your support.